Despite the fact that I have a lot less free time on my hands the past couple of months, I’ve still managed to play League in between other games and tasks. For a while there I was playing almost daily, and multiple games per day. But as is pretty normal for me, I tapered off to about one game per night, and for the past couple of weeks it’s only been a game here and there. I still love League, I’m not sure when/if that is going to change. My play time with the game didn’t start to taper off until the latter part of March, so I still had enough videos to cut down and splice into a highlight reel for the month. This was something I had considered doing for a long time, and since I started recording all of my games back in January, it’s not only good for my YouTube channel, but it’s something else to write blog posts about as well. However, I feel like playing Normals for three months straight is getting kind of stagnant. I think it’s time that I finally get started with my Ranked placement matches, and see how far I can climb up the latter. We’re nearing mid-season, and that means that time is running out to get the ball rolling. This season feels more tumultuous than previous ones. The pre-season changes really mixed things up, and we’ve been seeing champions that were designed to be played as a certain role excelling in multiple roles. It’s been great for the game in my opinion, but one thing that was bothering me was the fact that the games felt so much shorter and less forgiving. Bouncing back when the death timers are high was becoming nearly impossible. It seems that Riot has noticed the same thing and there have been changes to death timers at certain points in the game. It also feels like each knew patch has had more flavors of the month, rather than just one or two. What I mean by that is, in past seasons it seemed like each new patch would buff one or two champions who would be played nearly every game until the next patch, and then a new “flavor” would take over. This season, it feels like there are several “new meta” picks each patch, and as a result I’ve been playing champions I hadn’t played in a long time due to their new found power. Champions like Poppy, Pantheon and Quinn, not to mention old favorites of mine like Nocturne and Twitch have all seemed to spike in power and popularity. The constant reworks of champions (like Shen and Poppy, and the upcoming Taric rework) has brought the older ones up to speed and it feels like most of them are viable picks now. There are very few champions that have been completely neglected anymore, and I love seeing weird picks that work. Here’s the new one that I just finished editing, for March. It’s a bit shorter due to less games played but I think that’s good for people with short attention spans anyway. If you guys can do me a favor and like, share and subscribe that would also be great. I seem to have hit a subscriber wall and would like to continue to grow! So as I said, my plan for April is to at least get my 10 placement matches in to see where I’ll start this season. It will likely be Bronze I just like last season, but hopefully I’ll promote into Silver more easily this time around. See you then. For those of you who haven’t subscribed yet to my YouTube channel, I’ve fallen into a pattern of releasing at least one video a week. For the past couple of weeks, those videos were of League of Legends. I’ve been playing quite regularly and practicing with the new champion select, a few new champions, and at least one who has been reworked. Joining me has been Tacktix of Tough Love Critic, and to a lesser extent my other buddy Tyvokka (who has gone by other names that I’ve mentioned before), both of which are members of my guild Obsidian and part of our Fantasy LCS league. Lately we’ve been getting together several times a week to practice while jumping on Skype while we play. We may make the switch to Discord at some point though, as the guild is planning to use it more often once we start playing Crowfall together. I have to say, I love the changes that came through during season 6. The new champion select is fantastic, allowing you to pick two roles that you want to play and you are guaranteed to get one of those roles. This heavily cuts down on toxicity during champ select, though I have still seen some flaming during matches, but that’s never going to be eliminated entirely. I’ve noticed having at least one of my friends on and having voice comm has helped with my map awareness and shotcalling abilities. I started gravitating towards top lane during last season, but oftentimes took up the support role because that would help me to focus on objective and vision control. Having practiced support last season helped me to carry those skills over to the top lane, and playing characters like Shen with a global ultimate means paying more attention to the map. I also always run teleport up there, so that helps too. There have been many times that Shen ult or well timed TP have been game changers. Through practice this season with the new masteries, item changes and other tweaks, I’ve found a handful of champions I rather enjoy playing up in the top lane. For a time I was picking top + fill in champion select. After being stuck in the jungle a couple of times, I’ve found that Trundle (who I’ve spammed A LOT up top) is a fantastic jungler. Now I’m picking top + jungle in queue, and have found success in both roles more often than not. Tacktix plays Thresh support primarily, and between the two of us we have heaved several low-skill teams on our shoulders and turned dire looking situations into wins individually and for our teams. It’s been a huge confidence booster, and I’m really looking forward to doing our placement matches in ranked mode very soon. Occasionally I’ll switch things up and play some ADC too, though I really only want to be in the bot lane if I have him backing me up. So far I’ve been loving Trundle, the newly reworked Shen, and Tahm Kench up top. I have played around with the reworked Poppy a bit, along with being relatively confident with Maokai and Illaoi. I think that’s probably enough to work with. I’ve only really played Trundle in the jungle, but I think a couple of these other champions might work well there also. On ADC I’ve mostly played Corki, Jinx and Caitlyn, but I want to get some time in with Graves as well. The massive ADC rework threw me for a loop for a while there, but I’m starting to wrap my head around it. Oh, and if you haven’t yet, subscribe to my channel for all the newest videos! Thank you! 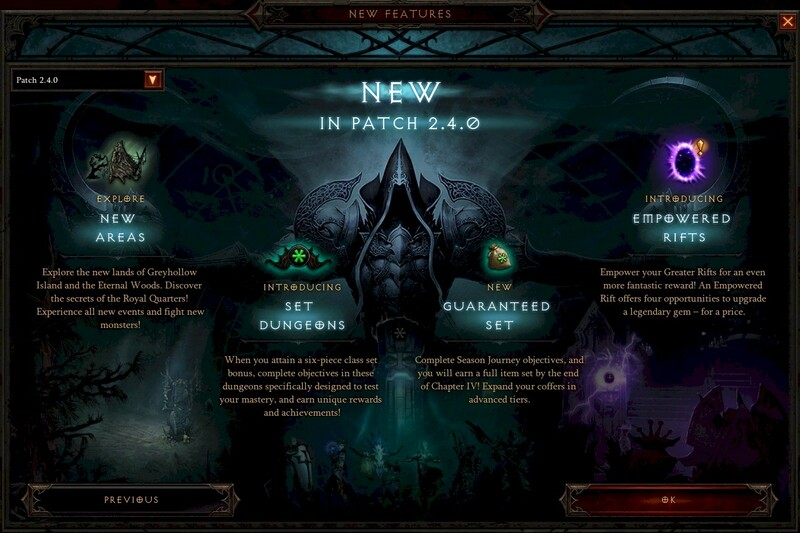 Diablo III had another big patch go live this week, and just like in patch 2.3, there was a whole new zone added to Adventure Mode. This does mean that you need to own Reaper of Souls to access the new content, but if you haven’t picked up that expansion by now, you’re probably not much of a fan. The brand new zone added is called Greyhollow Island, and it is an offshoot of the Act V portion of the map. A gloomy, rainy, wooded island, there are plenty of new creatures to fight, lore bits, and places to explore. Outside of the new zone, there was also two previously existing zones that were expanded, both the Ruins of Sescheron and Leoric’s Manor. The former was expanded with the zone called Eternal Woods, and the latter had a section called the Royal Quarters added to it. They are smaller areas, but combined with the new zone add quite a bit of variety to your bounties and other adventures. There’s much more to the patch than just new zones. Set Dungeons have been added, and require you to don a full set of class armor to enter them. The seasonal journey that was introduced in season 4 is also being tweaked for season 5 (that starts tomorrow), where completing it provides a whole set, so if you are having trouble finding a set of armor for your class, you have a guaranteed way to pick one up now. That will allow you to check out the set dungeon as well. Finally, there are empowered rifts, which is building upon the ever-changing rift system that has been around since RoS launched. I have no experience with the latter, so I’m not sure how good or bad that ends up being. All I know is that I feel re-motivated to try and complete the season journey this time around, and actually get far enough into the end game to see beyond Torment I and jump into greater rifts and all that good stuff. Who knows if that feeling will be maintained for very long, but I’m aiming towards getting balls deep in Diablo III again. Part one is a full clear of Greyhollow Island. It’s a fairly large overland zone with a lengthy dungeon so this is the longest of the three videos. Part two is a full clear of the expanded zone of of the Ruins of Sescheron: The Eternal Woods. This zone is a bit smaller and also comes packed with a dungeon but it is only one level and was a much quicker clear. Part three is the shortest run of them all. The Royal Quarters is a section added onto the Leoric’s Manor zone. It is filled to the brim with undead but is a relatively short clear. It is also the area you have to access to be able to enter the set dungeons, as you’ll see me discover in the video. That’s all I have for now. Happy Gaming! I uploaded the video in the wee hours of the a.m., as I acquired a new video editing tool, and it took me a while to get the hang of using it. Now that I have the foundation down, I can only improve with practice. You might notice that the transitions aren’t that fluid, and I see it too, but I’ll get the kinks worked out. I still have several hours of footage to comb through, so expect a part two in this series at minimum, but a part three is likely as well. Anyway, there’s plenty to watch, so I’ll let you get to it. Enjoy.